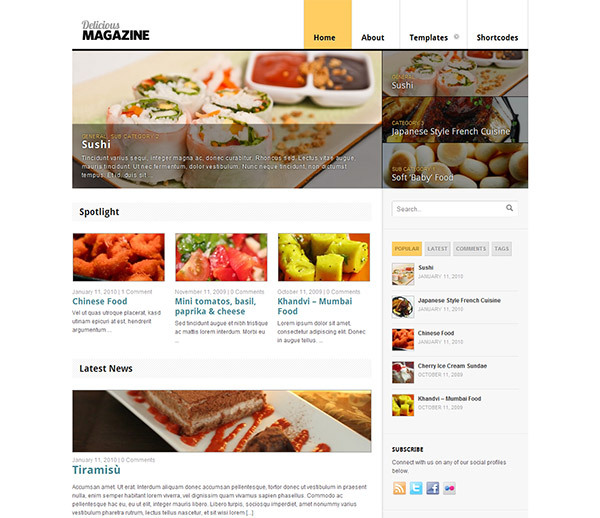 Delicious Magazine is versatile theme that can be used for a variety of purposes, like a food website for example. This WordPress theme includes a big featured area that captivates the user with large images, and also a sub featured spotlight area that makes your homepage look like much more than a simple blog. The featured post panel shows three posts you want to highlight on your site. It can be setup to have a slide or fade transition and also auto-rotate. All this is controlled in your options panel. You can customize all the typography in this theme, and there is full support for Google Fonts in the font selector. Below the featured area is a spotlight section where you can show off more important posts in addition to those in the featured area. You also have an option to show your latest posts in a two-column layout on the homepage. 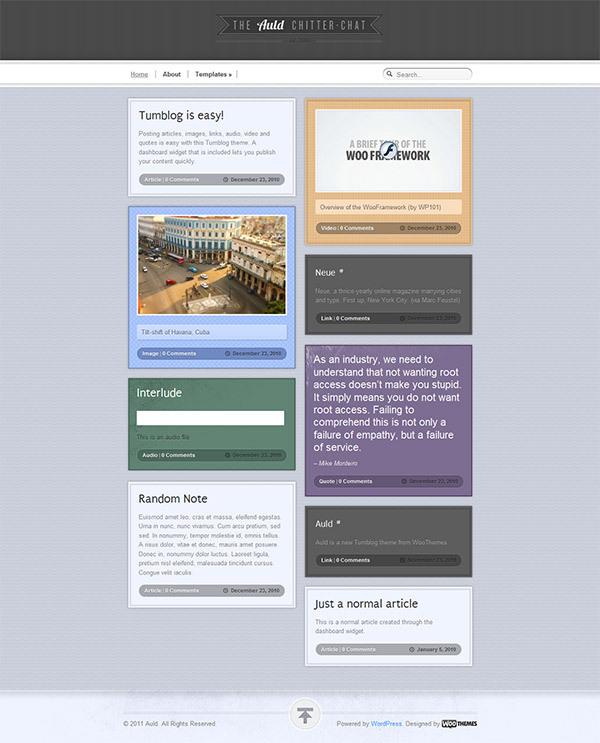 The theme has up to 4 widgetized areas in the footer and 1 in the sidebar, and as always comes with custom Woo Widgets (Adspace Widget, Ad 125×125, Embed/Video, Flickr, Tabs, Subscribe/Connect, Search, Twitter Stream, Blog Author Info). The theme includes 9 alternative color styles which you can preview in the demo, but you can also customize the background color/image and modify your link and button colors in the options panel so you have full control of how the theme looks. 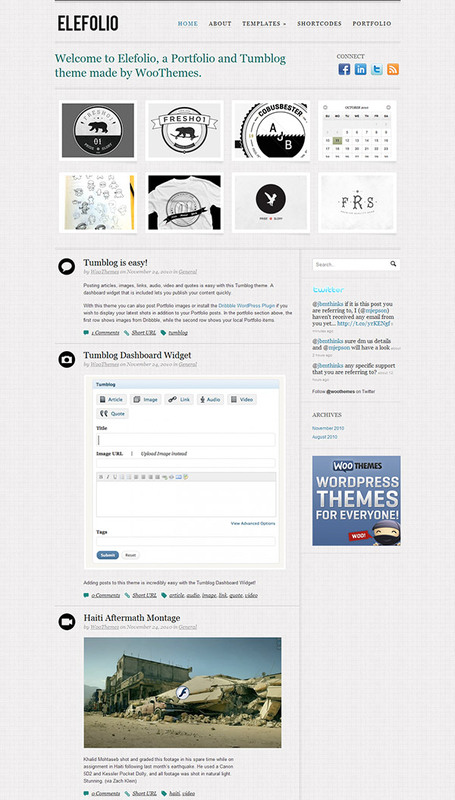 Elefolio combines easy Tumblog publishing and a Portfolio to showcase your work and posts. The portfolio uses custom post types and can also stream from your Dribbble account. It will impress any visitor with its simple yet detailed look. The homepage shows a welcome message to tell your visitors about you, along with social media icons. Last but not least is the slick portfolio section. The portfolio section shows your own custom post type portfolio items, and can also stream your Dribbble images if you have an account with Dribbble. You can customize the typography in the theme to suit, and there is full support for Google Fonts in the font selector. The theme a widgetized sidebar, and as always comes with custom Woo Widgets (Ad Space, Blog Author, WooTabs, Search, Flickr and Twitter). The theme includes 9 alternative color styles which you can preview in the demo, and also has styling options for background color/image and setting link and button color. Making simple changes without editing code, like adding your own logo, changing to an alternate color style, adding Google Analytics code, couldn’t be easier with the theme’s backend options panel. The theme is tested to ensure it is compatible with all the modern web browsers like Firefox, Safari, Chrome and Internet Explorer. An image resizer script is built into the theme framework that automatically scales your post images for pixel perfect display in the template. No need to upload new cropped images when re-designing your website. It also comes packaged with a .po file for easy WordPress theme translations into your desired language – editing one neat little file without hunting down text in all our theme templates.